The renowned climate scientist Dr James Hansen says the UK and Germany must resist new coal-fired power stations. He wants Prime Minister Brown and Chancellor Merkel to block plants that have the potential to substantially increase carbon emissions. 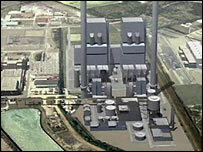 The UK is considering a new coal plant in Kent; and Germany has plans for new stations in Hamburg and other cities. The leading Nasa researcher is writing to the leaders to explain why he believes their decisions to be crucial. "It appears that it is not recognised that we're going to have to phase out coal use except where we capture the carbon dioxide; or we're going to produce a different planet," Dr Hansen told BBC News. "It's going to include loss of all the Arctic sea ice, it's going to include large sea-level rise and large regional climate effects." He was speaking here at the American Geophysical Union (AGU) Fall Meeting, the largest gathering of the year for Earth scientists. The US space agency researcher - who was one of the first to raise the issue of global warming back in the 1980s - believes the decisions taken by Britain and Germany could prove to be the "tipping point" that persuaded other nations to follow cleaner technologies. "They have the opportunity to get the ball rolling," he said. Asked why the decisions of these two countries were so important when China is already said to be building the equivalent of two new coal-fired power-stations a week, he argued that the European countries had a historic responsibility to lead the way. In support of this, in the letter he is drafting to Gordon Brown, he cites figures for "per capita cumulative emissions". These are the total emissions of carbon dioxide from the late 18th Century onwards. On this basis, even though other nations put out more CO2 today, the UK can be viewed as the world's "biggest emitter". This is explained by the fact that Britain led the industrial revolution. Dr Hansen applauds both European countries' CO2 commitments and targets, and says their leadership on the issue of coal could seed "the transition that is needed to solve the global warming problem". But concerns over energy security have led to demands in both countries for coal power to be expanded; and although there is much talk about the greening of coal through the capture and burial of CO2 emissions, the technology is seen as expensive and unproven. 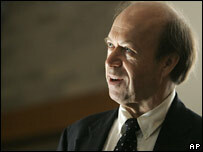 As director of the Nasa Goddard Institute of Space Studies, James Hansen has been a vocal critic of the US government's stance on climate change, and once complained that he was being prevented from making public statements on the issue by political appointees within Nasa. He came to the AGU meeting to discuss the current state of climate science with other researchers. He said the present concentration of CO2 in the atmosphere (380 parts per million by volume, ppmv) had already committed the Earth to large climate impacts, such as the loss of summer sea-ice in the Arctic and sea level rise greater than one metre. But Dr Hansen stressed that the point of no return had not been reached - that irreversible change had not taken place. He said that to get the Arctic ice to recover would require a reduction in CO2 concentrations down to about 300 or 350 ppmv. He believed this was possible, and called for greater energy efficiency and corrective pricing of carbon to allow cleaner technologies to compete and take over from fossil fuels.